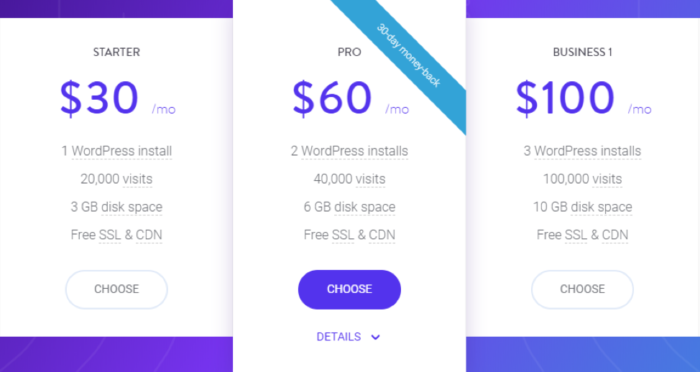 Kinsta hosting is one of the most highly reputed WordPress Hosting company in the market. They provide top-notch services with consistency in performance. The company has been providing services from the last five years with a cutting-edge technology. Their decade of experience with WordPress reflects in the services they provide. Let’s review what Kinsta provides in detail and find out what things you must consider before choosing a hosting company! Cutting-edge technology such as LXD software containers, MariaDB, PHP 7, and Nginx that makes sure that the website loads within a fraction of a second. Automatic scalability which is one of the most desirable technologies in businesses. Highly secured with constant scans to stop attacks and prevent malicious content from infecting the website. Powered by the Google Cloud platform and its 17 global centers. The wide range of networks allows rapid transfer of data without lengthy delays. Here is the detailed list of features and some awesome functionalities that Kinsta provides out of the box. 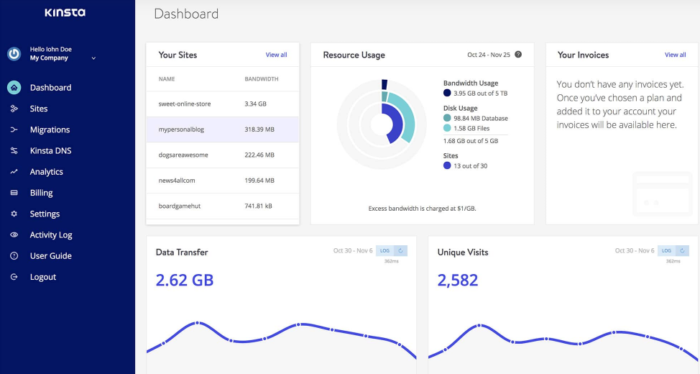 Kinsta offers free site migration without any downtime. All you have to do is to sign up for an account at Kinsta, fill migration form in your Kinsta dashboard and the tech team will schedule a day and a time to migrate your site. The best part is that they even provide a free test run before your site goes live. The company offers a very powerful dashboard. The panel lets you easily access your sites. Create new FTP account, add HTTPS, and view your past backups just by one click. The panel is user-friendly and extremely easy to use. The dashboard also contains ‘Analytics’ section from where you can view the analytics throughout the day. Kinsta runs an uptime check on all the sites it hosts every 5 minutes. The clients have never complained about it and it is safe to say that Kinsta provides downtime-free services. The company keeps its word and fixes issues before users even know it. This is an amazing feature for every hosting company. When it comes to backups, Kinsta undoubtedly wins. Other hosting companies claim to provide daily backups and most of them actually do but Kinsta creates backup within no time without any server overhead. Moreover, the backups do not merely contain website elements but have your complete system backed up. You can then easily restore the backup with a single click. Here is also a great list of WordPress backup plugins if you want to do it your way. Kinsta admin panel allows you to setup your custom SSL certificate on your site. Furthermore, the company offers Free SSL support through ‘Let’s encrypt’. This saves you from the ordeal of having to spend a major part of your time obtaining certificate keys. Kinsta has 17 server locations worldwide. You can choose one of the data centers for each of your sites. The closer you are to the data center the faster is your load time. You can change your PHP version just by one click. PHP 5.6, 7, 7.1, and 7.2 are supported. This means you can easily operate your third-party plugins without any hassle. (b) migrate an existing one. Everything you need is available and adding a site will not be any complex. If you are new to building and migrating sites, Kinsta is just perfect. With Kinsta, you can create a staging site (a staging site is basically a copy of a live site except that it is not live). Developers know how important a staging site is in the development process. Staging is a feature of a high-end managed hosting site. You can edit your blogs on the staging site and then apply the changes to the original site once you are done. It is one of those features that you should definitely check while buying a hosting server for your site. Initially, the uptight security of Kinsta makes sure that hacks don’t happen and in case anything does happen, it’s on the company. It provides a quick fix without costing you a penny. The expert support team is well equipped with every type of hacking fix so that you don’t have to worry about anything at all. Kinsta is built on the Google Cloud Platform. The site can automatically scale up whenever needed without having to manually check it and then scale. Even in the case of sudden traffic surge, the servers will be fully functional without affecting its performance in any way. For customer support, a quick feedback, as well as online support feature, is available. The team is quick to respond and monitors the status of external and internal systems 24/7. The company not only claims that ‘no issue gets resolved’ but stands by it as well, take it from our experience. The team is expert in WordPress and all of your WordPress queries will be solved within no time. Be it server maintenance, troubleshooting, theme, and plugin building, Kinsta support team has got you covered. Kinsta has a range of price plans starting from $30-900 per month. The wide range of packages meets the needs of business of every size whether it’s a startup or a generation’s old business. Its Pro package offers a 30-day money back guarantee. Why should you choose Kinsta? Kinsta is a large hosting platform that has made hosting very simple. No matter how much the traffic spikes, the server’s performance will not be affected. This is the reason why large scale businesses use Kinsta without even giving a second thought to it. Kinsta may be expensive for the ones working on a small business but its 100% uptime, daily backups, and performance consistency are like no other host and a total worth of money. We may sound way too positive about it but believe us; Kinsta is actually as perfect as we are telling you it to be. 000WebHost Review – Why Has it Become a Household Name?